It is said that one of the most important pillars of any democracy is the media. Media that acts as a watchdog, keeping an eye on and bringing the truth to the fore. Upholding the citizen’s right to know. In essence, maintaining the very fabric of any free country by democratising information. Unfortunately, the Indian media spectrum has seemingly developed a penchant for overstepping their bounds, and in the zeal to garner readership, the alternate media seems to have gone a step ahead. Gone are the virtuous protectors of the truth. The knights who fought for the very sanctity of the nation. Today, the Indian media and some of its players have turned into bloodhounds who are worse than the enemy at the gate. The Pakistan intelligence services (ISI) had arrested Kulbhushan Jadhav, an Indian National and ex Navy commander on 3rd March 2016 on Terrorism charges alleging that he was carrying out subversive activities inside Pakistan on the behest of RAW (Indian Intelligence agency). He was arrested from Balochistan during a counter-intelligence operation, as claimed by Pakistan, and was sentenced to death in a field general court martial on April 10th 2017. However, an Ex-ISI officer exposed Pakistan’s lie and confirmed tat Jadhav was abducted from Iran and not from Balochistan, as asserted by India. Pakistan is a terrorist nation that has vowed to bleed India with a thousand cuts. The abduction of Kulbhushan Jadhav, the lies that surrounded his abduction, the sham of a trial that was given to him by Pakistan, the doctored confessionals and the fantasy theories about him being an Indian spy are methods that Pakistan is using towards that end. Pakistan, however is a known enemy. What is unknown, is what is most threatening. A glaring example of this debauchery is a portal called ‘The Quint’. ‘The Quint’ today had the temerity to publish an article that could have been easily published in any leading Pakistani newspaper with their reigns in the hands of ISI. What Pakistan tried to prove with deceit, The Quint has put into words and attributed it to highly placed RAW sources. It published an article not so long ago today, detailing how their sources have confirmed that Kulbhushan Jadhav is an Indian spy, something the Indian Government and the RAW have actively and vehemently denied. At the onset itself, the author, Chandan Nandy, not only declared that Kulbhushan Jadhav is an Indian Spy, but that he was a sub par spy used as a source for “deep penetration” in Pakistan. It bodes well to remind here that an ex ISI officer already admitted that India’s stand regarding Jadhav being abducted from Iran and not Balochistan is correct. Calling him a spy is going against the truth and endangering not only his, but India’s security. Calling him a “BAD spy” is psyops 101 where you not only prove that the enemy nation is a liar, but prove that their entire intelligence network is a sham. Begs an important question – Whose side is The Quint on? Next, the author proceeds to provide ‘proof’. According to The Quint and the author, the clearest evidence of Jadhav being an ‘Indian Spy’ came to light after Pakistan abducted him. I’m not aware of the parallel planet that the author seems to live in, but might I remind him that even Pakistan doesn’t take Pakistan seriously, and he is, considering Pakistan’s word as the gospel truth against his own nations version of truth. Perhaps I can try to give the author a basic lesson in counter intelligence. A SPY WOULDN’T TRAVEL INTO ENEMY TERRITORY WITH HIS INDIAN IDENTITY PROOF! At this point, it is needless to go into details of the case since malice can’t be countered with facts. But even propaganda must be one at least backed with basic logic, which this piece clearly lacks. Next, the author talks about how and from where Jadhav was captured. Here is where the deceit gets worse. Pakistan army claimed that Jadhav was captured while he supposedly crossed over from the Saravan border into Pakistan. 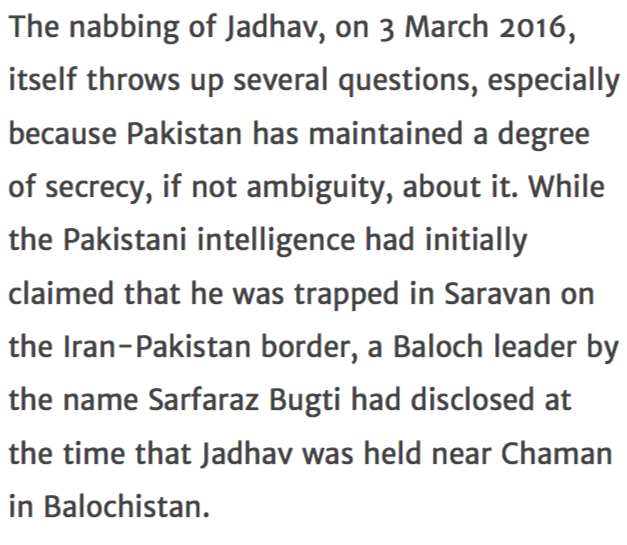 And according to Quint, a “Baloch leader” called Sarfaraz Bugti disclosed that Jadhav was held near Chaman in Balochistan. Firstly, Saravan border is the Iran-Balochistan border. The “Baloch Leader” that the author talks about Balochistan’s Home Minister who obviously answers to Islamabad. What is most intriguing is how Quint considers Pakistan’s version as the gospel truth without mentioning that days later, ex ISI officer confirmed that Jadhav was indeed abducted from Iran and not Balochistan province. Quint also ignores India’s version which was that he was in Iran and not in Balochistan. Again, whose side is The Quint on? Next, The Quint reveals what this article was really meant to do. The crux of the matter according to The Quint : Jadhav wasn’t abducted, he was captured. 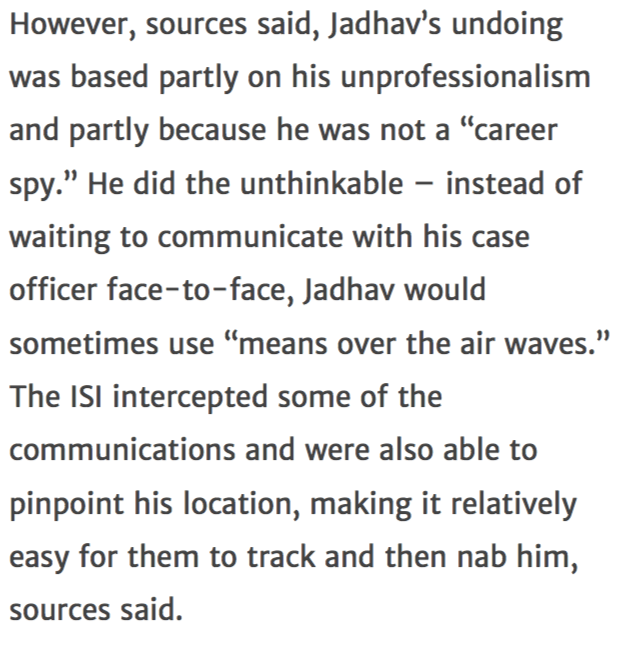 Jadhav was ‘captured’ because the Indian Spy didn’t know how to do his job. The Indian spy was unprofessional. The Indian spy was a novice. In essence, the Indian Intelligence agencies are trash and don’t know how to do their job. It might seem like I am paraphrasing some deranged ISI operative, but strangely, I’m only inferring what The Quint seems to implying, that is, Pakistan is innocent. At this point, I would suggest the reader sits down, because the rage might be a little difficult to handle. Let me paraphrase what the above excerpt says : Jadhav was not sound in statecraft. The RAW was stupid to hire him (considering Quint has already declared that he is a spy, in tandem with Pakistan) and that India would have been better off had she hired the far superior Baloch or Pakistani nationals to gather information. This isn’t even the worst part. This mysterious source that seems to be vomiting all sorts of rubbish, says, and I quote from the article, “his incarceration and the ambiguity surrounding his “work” does “have a lot of benefits”. 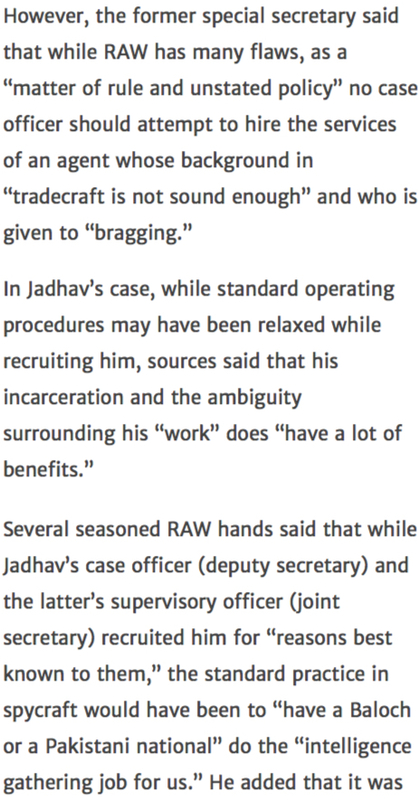 Let me say that again : The mysterious source says, and the author writes, that Jadhav’s incarceration has a lot of benefits. Well, pardon me if I don’t join the party that seems to be taking place at The Quint’s office celebrating Kulbhushan Jadhav’s incarceration. Next, the mysterious source through the author has a nugget of wisdom for Indian Intelligence agencies. Mr Ajit Doval certainly needs to pay heed to this fantastic advice. Please don’t send spies to hostile nations. Send spies to friendly ones. Maybe to get this author some scotch? Next, the mysterious source has an intriguing question. I would like to send a message to this ‘anonymous source’ through the author of this article, Mr. Nandy. The Prime Minister of India, Mr. Narendra Modi once declared our foreign policy objective from the ramparts of Lal Quilla. Balochistan deserves justice. And we are to believe, that this rambling was the brain wave of some former RAW chief? Because a RAW chief would ask such juvenile questions? Sure! I am reminded of another article I wrote a while ago about fifth column warfare that is being waged by Pakistan in India. A Pakistan Senate report specifically said that Indian conversation around Balochistan needs to be thwarted. Of course, someone who would take Pakistan’s word as the gospel truth would certainly also wonder what might India’s foreign policy objective be in Balochistan. The Quint is a habitual offender. Mr. Nandy was the author who wrote about the supposed surgical strike before the Indian Army came out with the details thereby potentially jeopardising the lives of the soldiers. A journalist of The Quint was being investigated under Official Secrets Act owing to a sting operation that drove a jawan to committing suicide. And now, The Quint has come out, all guns blazing, to exonerate Pakistan, denigrate India and tell the nation to be happy about Jadhav’s incarceration. One wonders, when does this cycle of media deceit end? When does the media take responsibility for their actions? 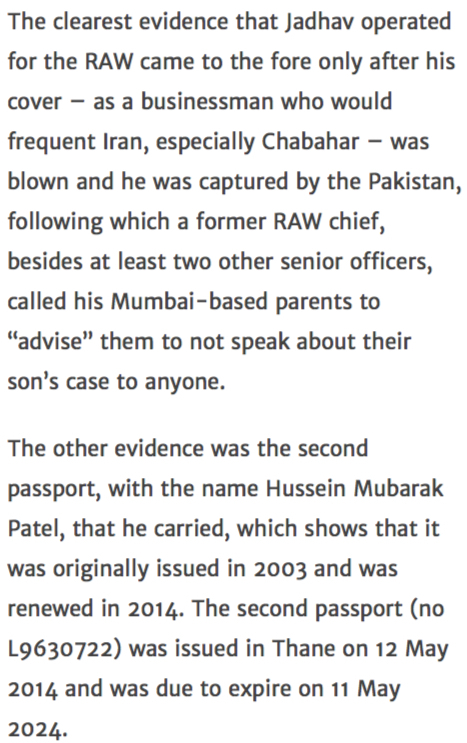 And one also wonders, if the authorities would take any action against this article, the portal and the author for this brazen article that potentially harms India’s diplomatic stand and Jadhav’s life.